This remarkable actor's most important contribution to the development of Italian-style film comedy is to be found, not in films where he places his comic talents at the service of farcical characterizations, nor in those where he contributes, after his inimitable fashion, to an effective satire of social conventions. Sordi is truly irreplacable in those films in which he lends substance to the figure of the average Italian immersed in the great historical ordeals of the nation. What Steno and Monicelli had started to do with Macario and then with Toto finds in Alberto Sordi the ideal interpreter. This ultimate fate of the Sordi "personage" could already be glimpsed in a mediocre film from 1954, TRIPOLI, BEL SUOL D'AMORE (TRIPOLI, FAIR LAND OF LOVE) by Ferruccio Cario, where Alberto Sordi was a farm boy recruit drafted into the Bersaglieri and immediately sent to Libya, in a desert outpost beseiged by Arabs during the Italo-Turkish war of 1911 which ended, in fact, with the Italian conquest of Libya. Unfortunately, the idea of using several excellent comedians (included, as well, Riccardo Billi and Mario Riva) to recount a war episode in a satirical key was spoiled by a trite development which reflected the conventional tenets of the comic-sentimental adventure story. 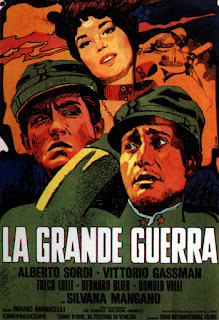 It was not until 1959, with Mario Monicelli's LA GRANDE GUERRA (THE GREAT WAR), that the actor got his chance. The film met with extraordinary success right from its first appearance at the Venice Festival: it won (ex-aequo) the "Gold Lion" plus an Honorable Mention from the jury for Alberto Sordi's performance. The new idea of Luciano Vincenzoni's story (put into script form by him and the director, Age and Scarpelli) was to view the First World not in its heroic aspects but through the eyes of two cowards. 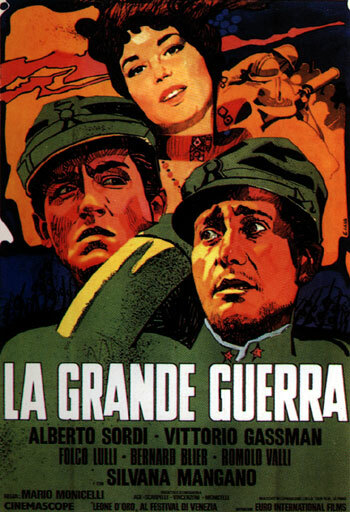 Oreste Jacovacci (Sordi) and Giovanni Busacca (Vittorio Gassman), two poor devils and small-time chiselers, one groveling and cagey, the other conceited and cocky, find themselves in the front line trenches after having tried everything to be exempted. They try to take as few risks as possible and to survive, but, captured by the Austrians, they are seized by a spurt of dignity and honor and, refusing to reveal the disposition of the Italian troops, let themselves be executed, dying despite everything as heroes. Monicelli, also setting great store on certain Italian novels and stories of the '20s and '30s, forcefully portrayed the grueling life at the front, the cold, the fleas, the hunger and the daily risk of dying. But this image, typical of any war film, takes on an unusual flavor of truthfulness in the programmatic rejection of any kind of war rhetoric. Heroism is not obligatory, the director seems to say, and the ordinary man gets there because the situation leads him to it, doing his duty even when he is convinced he doesn't know what it is or refuses to do it. What emerges is a striking "polyphonic" work where epic and individual sequences alternate, well-defined and diversified characters stand out and the humorous tone endows those characters with a remarkable human vitality. Gassman, celebrated Italian stage actor, for the first time tackles a comic role, and Sordi, by then a famous comedian, effortlessly assumes even the most dramatic tones. The film helped to open the discussion on Italy's participation in the First World War and on how it was experienced by the people.